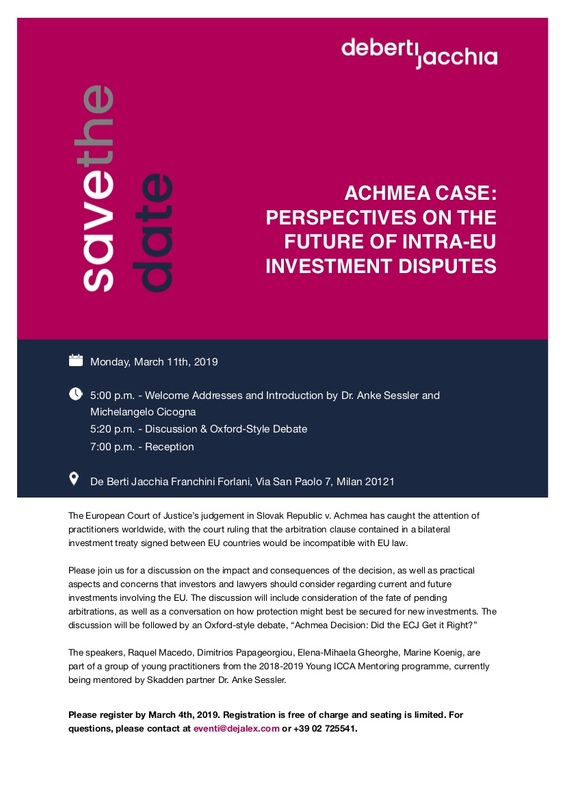 The European Court of Justice’s judgement in Slovak Republic v. Achmea has caught the attention of practitioners worldwide, with the court ruling that the arbitration clause contained in a bilateral investment treaty signed between EU countries would be incompatible with EU law. The speakers, Raquel Macedo, Dimitrios Papageorgiou, Elena-Mihaela Gheorghe, Marine Koenig, are part of a group of young practitioners from the 2018-2019 Young ICCA Mentoring programme, currently being mentored by Skadden partner Dr. Anke Sessler. Please register by March 4th, 2019. Registration is free of charge and seating is limited. For questions, please contact at eventi@dejalex.com or +39 02 725541.